I love semolina porridge. The comforting texture and taste, and the fact that it is light on the stomach, have made it one of my favorite foods to enjoy on a chilly night. Browsing through some health information on this wonder grain, I realized it has some stunning health benefits, too! Semolina is made from durum wheat, so it is digested slowly. This helps you feel full longer and prevents you from overeating. Semolina improves kidney function, thanks to its potassium content. Add some chopped nuts and raisins to your semolina porridge, and you increase its nutritional content as well as taste. Add some chopped vegetables to savory semolina upma, and you have a power-packed, as well as delicious, meal in a bowl. Semolina is a good source of two vital vitamins: E and the B group. Both, as we know, are essential for good immunity from disease. 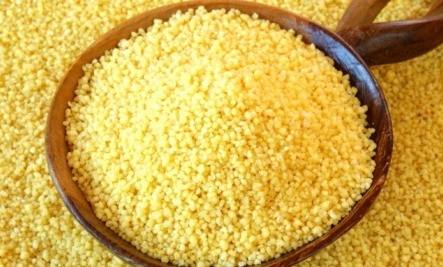 For those who lead an active lifestyle, semolina is a quick and nourishing source of energy. Of course those with gluten intolerance would need to avoid eating semolina. Semolia is NOT a "wonder grain." It is not even a grain; it is the by-product of refined, processed wheat flour. Therefore, as it is processed refined flour, it is high is simple carbohydrates, has little beneficial fiber and is bad for blood sugar. Semolina may be tastu but, comparatively speaking, it is NOT healthy. You'd be better off with whole grain cereal like stoneground oatmeal or granola. I saw on the web somewhere, that this is eaten similarly to oatmeal(with fruits and nuts) as in the middle east for breadfast as we Westerners, eat oatmeal for breakfast. There is a specific name for it, I don't remember what they called it. They didn't call it semolina either, I looked up the word they called it and the definition was semolina. I just had Semolina (the Nigerian way) with vegetable soup, garnished with periwinkles and dry fish for lunch - Sumptuous!